Wouldn’t it be nice to sit down in front of that perfectly stuffed turkey knowing you and your family are giving back? The National Alliance to End Homelessness reports the homeless population in this country peaked just shy of 650,000 people last year. That means many kids can’t watch the parade or even have a decent meal without help from others. This is the year to add service to your family traditions. Look at five ways you can reach out to someone else this Thanksgiving. A food drive brings people together to help the community. Nonprofit organization Move for Hunger is there to help volunteers through the process of organizing a food drive. They will even provide the necessary supplies and pay for transportation of food to the local food bank. For a successful drive, you need to set up at least one drop off point. AARP suggests staffing one station 2-4 hours each week for several weeks. Possible locations include a preschool or daycare, senior or community center, church, public school, neighborhood, work or a local business. If using numerous drop off points, ask volunteers to help cover each spot. Turkey trot image by E2Brutai via Flickr. 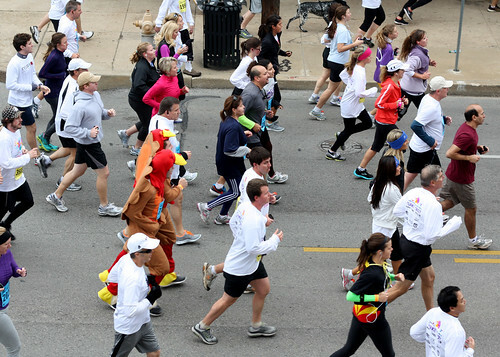 The turkey trot is a footrace held each year on or around Thanksgiving. Many major cities in the U.S. participate and the tradition even extends through the December holiday season. The races vary in length, but the average is five miles. The oldest turkey trot, held in Buffalo, is a five-mile trek that starts north of the Delaware Park and goes all the way to the Buffalo Convention Center, explains the YMCA. Runners pay a fee to participate and that money goes to local charities. Active.com offers a listing of turkey trots all over the country. You can use your car to help charities in the neighborhood deliver food to low-income families or senior citizens. For example, Meals on Wheels is a nonprofit that brings meals to elderly individuals in every state. They can connect you with a local chapter where you can donate time or money. You could take your service even further by adopting a local needy family. This is an above-and-beyond approach that offers comprehensive help to a family looking to break the poverty cycle. You can pitch in to help them buy clothing and food or throw birthday parties. You can also surprise them on the big day with holiday gift baskets at FTD.com and help them set up their special Thanksgiving Day meal. Family-to-Family provides connection to a local family that needs you. Duty takes many soldiers away from home each year. Local families near military bases can take in an estranged soldier for Thanksgiving dinner through the Adopt a Soldier program. You can also reach out to military personnel overseas. There are limitations on mail packages accepted at any service base, but Military.com offers a list of approved organizations that perform this service. You purchase a care package or gift card from them, and they send it on to a soldier who needs a boost this Thanksgiving. As a stay-at-home mom, Jennifer loves to freelance write about travel, fashion and advice for new parents.